HOW TO PREPARE THE PAPER? What I am showing is MY method, other artists work in other ways. I work on 300lbs or more, I used to stretch my paper but I have found that a few artists commented about not to and I tried their method. I would not stretch paper again since I find that the paint is laying with beautiful result on a non stretched paper. I lay my paper on a MDF board, bought in B&Q, cut by my husband to my required sizes. I fix it to the board with masking tape and with staples from my staple gun all around the edges. Now I fix some more masking tape again to look like a mount, making sure that it is with right angles, I staple once more this masking tape at each corner only, it stops the tape from peeling off when it is wet. 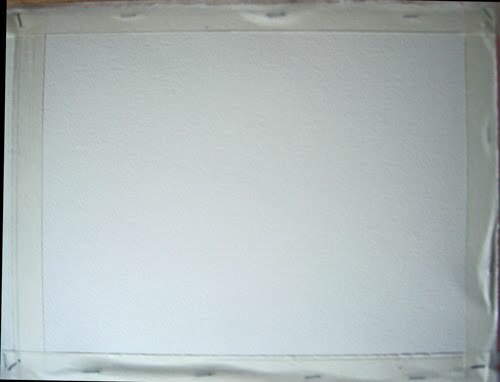 Once the painting is finished, this masking tape is removed and give an outlook of the painting with clean edges. Sometimes I have used large amount of water. In this case, the paper will buckle. I found a remedy to the problem.